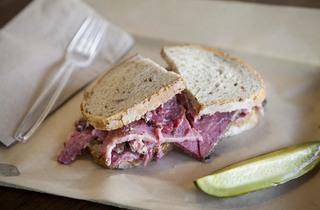 Chef Micah Wexler is looking to change up the deli scene with Wexler's Deli, a quintessential Jewish sandwich and bagel shop in Grand Central Market. Wexler's pastrami sandwich is already being lauded as one of the best in the city, his pickles fermented on-site are out of this world, and the house-cured lox is a force to be reckoned with. It's a deli that would make your bubba proud. A friendly cool place that does a few things well. Bagels with cheesy egg filling, pastrami and a specialty in smoked salmon and caviar, it's a good, inexpensive breakfast place. If you want espresso you'll be disappointed as they only do regular coffee, but they also freshly squeeze orange juice too! Tasty! The hype is justified (although, let's be real, nothing beats Langers in the corned beef or pastrami categories)--Wexler's is worth the wait (or worth getting there early to make sure they haven't sold out of what you want). 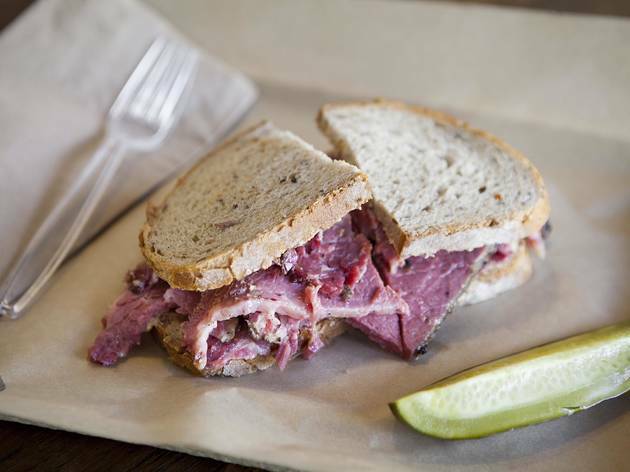 While their bagel and lox gets most of the praise, their pastrami on rye really is the standout item. They close early compared to a lot of the stands there, especially since that is often dictated by how long it takes them to run out of food. One of the spots I rush to in Grand Central Market is Wexler's Deli. I was not until fairly recently that one could get this quality of bagels and protein in the West Coast. The house cured lox is to die for. One day while waiting in line, I notice that they allow you to do a half and half bagel - half smoked salmon lox and half smoked sturgeon. Since then, this has become my go to order. Perfect for when everything on the menu is what you want. While the everything bagel is the vehicle of choice, I sometimes order it on this rye bread to be a bit more healthy. It comes with a schmear of cream cheese, red onions, capers and a slice of lemon (which is not needed). It is filling, refreshing and utterly satisfying. Digging it. Wexler's is one of my favorite stalls at GCM, mostly because of the pastrami sandwiches but also because of the pickles. And the bread. And the lox. The staff is super friendly, as long as you're considerate of other people waiting in line for a seat and don't idle at the counter for too long. Come for The O.G. and snag a black-and-white cookie to go.